Peanut Chutney and 2 awards! Yesterday was a busy and tiring day. We had to pack for our trip to India. Hurray! At last I get to go to India to see my friends and family. I'll be on a 1 month vacation from jun 4. Lovely isn't it? I am way too excited and looking forward for the same. I had to do all the packing and you all know how it goes with packing. The 2 things that gave me lot of energy was the 2 awards given to me from Uma and Gaurav. Thanks guys! it did boost my energy a lot! and 'Good chat blog' award by gaurav and I pass this to all my blog friends who have been so inspiring to comment and chat! Now for the Peanut chutney. In a pan, add some oil and add all the ingredients excepting peanuts and saute them. Let them cool. In a blender add this mixture along with roasted peanuts and salt. For tadka, add some oil. 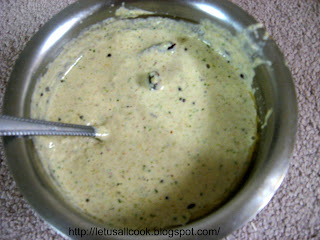 add mustard and when it pops add curry leaves and red chilli whole. Serve hot with dosas, idly. Dear Sangeeth, Thanks for thinking about me and passing on the award..indeed u made my day! the chutney looks yummy!! Congratulations for ur well deserve award. Love the recipe of peanut chutney, thanxxx for sharing!!! Congrats on the award. peanut chutney looks delicious. Congrats on your award..and thanks for thinking of me! Ah! trip to India? now that makes me jealous indeed. Have a great time. Congrats on your Awards! Have a fun trip!